The city’s inhabitants count on being able to go about their daily business without problems and disruptions. Food and other daily needs? For the city to function and be attractive, the city’s actors need to obtain a picture of how everything is interconnected and where there are areas susceptible to disruptions and breakdowns. This handbook offers a method with tools to strengthen the city and thereby reduce the negative effects of disruptions and breakdowns. 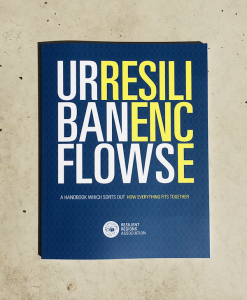 Urban Flows & Resilience – A handbook which sorts out how everything fits together is edited by RRA’s Olle Ulhmann. Click here to make an order. Mini book Bigger, Faster, Wetter. 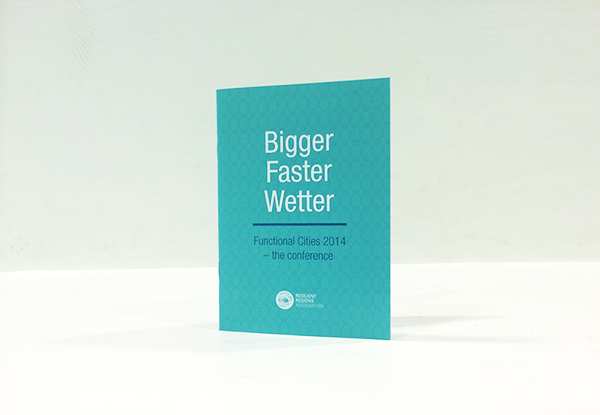 This minibook summarizes the presentations given at the conference Functional Cities 2014. Please email kontakt@resilientregions.org if you want to buy your own exampel. Write Minibook in the subject field and tell us how many copies you want with your billing- and delivery adress. Bigger, Faster, Wetter is written in english. Price: 199 SEK exkl. VAT (6%).